I made this beer-candied bacon to go in conjunction with a Bacon Stout Chocolate Cheesecake. 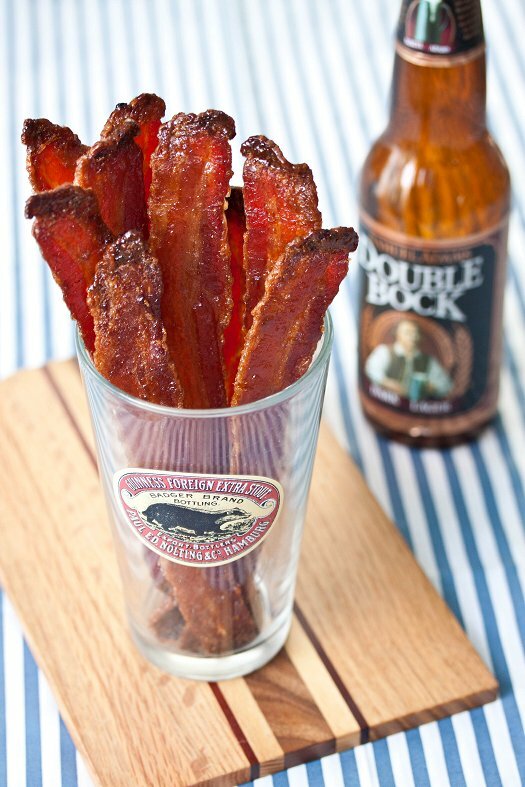 If you’re into the idea of beer and bacon, make sure to check it out here! I love candied bacon…drooling. Love the new site! Lol, I just happen to have about 3 lbs of bacon in my freezer and don’t know what to do with it. But now looking at this, well bacon and beer together, it must be a crowd pleaser. I always thought of putting bacon and nutella together, but beer works too. Men must love this. Woah. I bet that was *fabulous* on a burger! Could these be any more perfect for my boyfriend? I can hear him salivating already. Perfect for BLTs, burgers, or club sandwiches with an icy beer. Or just to snack on. LOVE the clear crisp photo too – I’ve never shot bacon before. Are you for real???? Best.Idea.Ever. *Drool. * For some reason, I have never made candied bacon! This will be remedied soon, thanks to your recipe. This is a great idea I am definitely going to try it! Oh my goodness gracious! This stuff is like bacon crack! I just made 3 pounds worth for a bacon themed party (I might be an Aggie by birth, but I can cheer for Bama just one night a year). Your recipe will be the perfect way to compete with tonight’s top runners: a bacon cheesecake and maple bacon cupcakes. Bring on the bacon coma! So glad you liked it, Katie! I actually made it to go in/on a chocolate cheesecake. Enjoy that bacon-induced coma! WHOOP! This is the best way to enjoy a Hog! Sounds Amazing! Do you think this would keep longer than the day you make it? Gretchen, most definitely. I’d put it in an airtight container and keep it in the fridge for up to a week. I freeze uncooked bacon all the time, with no problems. But, I’ve not tried freezing this myself – so I can’t say for certain! Sorry. Candied bacon freezes for months…..and refrigerates for nearly as long. I put it into the oven or microwave for a few minutes to crisp it up and to get it back to room temp. Gretchen, there’s something wrong with you if the bacon lasts longer than five minutes. Also, I have a lot of pre-cooked bacon…how would that work with this recipe? Just coat it and then put it in the oven? James, yes – I think that would work just fine! I saw that you said that most beers will work fine, just curious if you or anyone else have tried another beer? I’ve also made it using Yuengling, a medium lager. The only thing I’d probably advise against would be an IPA, while I love them to drink – the bitterness wouldn’t be good here. Thank you! I almost used Yuengling because it’s one of my favorite beers. Mine too! In fact…forget the bacon,let’s just drink a beer! I used smithwicks and it was delicious!!!! Thanks for the recipe!!!! As a reply to whether or not an IPA would work, I say yes. I just made a couple batches last night and all we had was IPA so I went for it. There isn’t any bitterness as I think the sugar overpowers it. I don’t like beer AT ALL and still quite enjoyed the candied bacon. That’s awesome, Ashely. Looking forward to trying it with an IPA soon then – thanks! Hold the phone. I just made this with Dogfish Head’s Punkin Ale. Pumpkin brown sugar candied bacon=out of this world good!!! You are my new favorite person! Dogfish Head Punkin Ale is my FAVE and I was thinking it would be perfect for this. Thanks for confirming! Unfortunately, I have done family members who have pork allergies…how do you think turkey bacon would work for this? Has anyone tried it yet? WOO HOO! This is going to be a new Superbowl munchie! I just made these .. kind of bummed because they didn’t turn out like the picture . I think you need super thick bacon ( as in the kind you special order from a meat shop ) because I got the thickest stuff they had at the store and it shrunk down to nothing after only 2 rounds in the oven . Darn it sounded SO good . Misti, I’m so sorry they didn’t turn out. I purchased the bacon I used at my local Walmart, but it was the thicker-cut bacon that they sell in 1.5 lb vacuum sealed packages. It’s definitely worth it to try again. As for the botched batch – they’d probably make wonderful bacon bits. 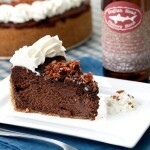 Or, I chopped my bacon up to go in a chocolate stout cheesecake anyways. Again, I’m very sorry the ingredient list wasn’t more detailed. I’m going to go in and specify thick-cut, high quality bacon right now! Just made this last night. I did it with Bell’s Two-Hearted Ale. It is SO good. I’m not sure how much of it will actually make it to the party I’m supposed to take it to tonight! Made this with Left Hand Milk Stout. Unbelievable! Made avocado, sharp white cheddar and bacon sandwiches. . .
Would also make fantastic Bacon Brittle! I wonder how pepper bacon would be in this recipe. Probably awesome. The basics from the recipe are mixing 2 Tbs of brown sugar with 1 Tbs of 8th Wonder Spice blend. Sprinkle half on the bacon in the cookie sheet and cook for 10 min at 350. Remove from oven, flip, sprinkle the rest of it, and cook for another 10 min. That said, last time I made it we had to cook it for another few minutes to get it fully cooked. I did a side by side comparison of the two recipes this past weekend, and they are both AMAZING. I couldn’t decide which was better! The one with the beer is a little more sweet and the one with the 8th Wonder has a little more kick (but not spicy). I can’t wait to make them both for a cookout or something! When I tried this it turned out just ok. I found some thick cut uncured bacon at Safeway. The uncured bacon was the only one I found that didn’t already have sugar in it. It seemed like the fat from the bacon kept the syrup from adhering well. I think if I were to try this again I’d reduce the syrup somewhat for better adherence and concentrated flavor. I used regular, cured bacon – and the mixture adhered to the bacon just fine. It appears to bead up on the surface of the bacon on the first application, but after some time in the oven and subsequent additions of the beer-sugar mixture, it stuck on the bacon in an even, thick layer. What’s the best type of beer to use? Any suggestions??? Any kind of stout (Guinness) or lager (Yuengling) would be good. Just stay away from bitter beers – like IPA (India Pale Ale). Always remember to support your local breweries! Making these for the second time tonight, my hubby and I love them! The first time I used thin cut bacon that I already had and the taste was still good, they just fell apart easy. Trying SUPER thick cut bacon tonight with a wheat beer! Excited to see how they turn out! Thanks for sharing the recipe! I found the recipe for the beer bacon cheesecake on Pinterest a few weeks ago and of course saved it to make on Superbowl Sunday! I just made the candied bacon…. oh dear. It tastes so heavenly. I am a strict turkey bacon girl (only because when I eat bacon, I want to eat tons, so it makes me feel less guilty), so when I have a taste of real bacon, let alone this CANDIED AWESOMENESS….. oh dear. I’m in trouble. I’ll be making the cheesecake tomorrow night… assuming I don’t munch all the bacon between now and then! And I thought I’d have to worry about the husband eating it all. This is DELICIOUS! I don’t have thick cut bacon and the stores here are closed today! Do you think folding the slices over would compensate for the thickness? No, I’d try cooking at a lower temperature instead – go with 350. Where did you find the pint glass? It was a Christmas gift from a friend many years ago. I think she may have gotten the set at Target. I made this yesterday for the Superbowl. This is the second Pinterest recipe that set off my smoke detectors. Smoke poured from my oven and I had to open all my doors and windows. The sauce was too liquidy and dripped onto the foil in my pan, which then burned and smoked up my house. IF I made them again, I’ll use less beer and use the outdoor grill. However (to continue my last post), they were devoured at the Superbowl party and the recipe was requested. Another note – they do need to cool on a cooling rack for at least an hour like the recipe said (preferably not the rack you used for cooking). Mine were still sticky when I went to the party, but they got better tasting as time went on – which wasn’t very long as they were gone quickly. I’m thinking I may spray the racks before cooking the bacon on them also. I’m sorry you had an issue with the smoke. I had some, but nothing that the exhaust fan didn’t take care of when I opened the oven door. And, I found that the bit of smoke that there was added to the flavor of the bacon. If you had a problem with the bacon sticking, spraying the rack might help. Or, just let the bacon cool slightly and then remove it to a piece of wax paper to cool completely. Made this for our Superbowl party – such a hit! Great Recipe. Do you think this would last if I foodsavered it and shipped it overseas? I would love to send some to my husband to give the food over there a pick me up. I’m very sorry – but I don’t think it would make the trip if it wasn’t refrigerated. Have you thought about some homemade candies? That would surely make the trip! I have a great recipe for homemade caramels. I’m sure anything you sent would be welcomed by your hubs. Thank you guys, for all that you do! First, I must say that this idea and recipe are amazing. Next, to respond to an earlier post by Autumn: Bacon, once cooked does indeed travel well overseas, esp. when glazed. I know this as a former Sailor myself. Finally, to report a method for using thick-cut (but not so premium) bacon, perform the above mentioned steps except, when setting the egg timer, set it for SEVEN minutes. Ensure not to let it cook for more than 28 minutes, otherwise it WILL burn. I’ve made Bacon Candy recently. Look forward to trying it with beer. Nice photography. Do you really mean 400c? I would have thought you’d have turned the bacon to a crisp of charcoal at that temperature. Once the candied bacon is made, how long can it be out of the refrigerator? Thanks! One commenter mentioned that they packaged and shipped it without refrigeration, so I’d say an evening is safe for sure! Made this and it tasted great. My bacon sat for a few hours but continued to be sticky. Any suggestions on how to get them “dryer” like your picture? They cooked for roughly 40 minutes. I’m thinking maybe it was the beer I used (left hand milk stout) or possibly not having the rack low enough? I’d try cooking it a little longer next time! You could also throw it under the broiler for a minute or so too, at the end of the cooking time. Great recipe! I made 1.5 lbs of this last night for a big to-do at our house this weekend. A few of them I overbaked and they are charred in spots – and still delicious. Cheers! Oh man… this has my name all over it! Looks so good! Congratulations on discovering the recipe for awesomeness. I know this stuff has to be on the list of deadly sins because it is too good!!!!! THANK YOU beer bacon recipe blogging lady! God bless you! We have a new favorite dessert that we will hide from the children at all costs! I made this today. I only made one pound to see how it would turn out. I was worried about the smoking from the oven. While I did have to open some windows, it wasn’t too bad. The beer candied bacon was absolutely delicious and looked just like the picture. I will definitely have to make double or triple batches in the future. Thank you so much for the great recipe. What about coffee, brown sugar, chocolate syrup and Sam Adams brown ale? Mocha candy bacon? Tammy, that sure as Hell sounds like a winning combination to me. Let me know how it turns out! Thanks Laura for this recipe- It was awesome. All we had was a large bottle of Shiner Octoberfest, so used that. It was a bit sweet for my liking, but my food group (theme was crunch time, due to a baby on the way), loved it. Any tips on beer or even sugar/spices that would make it a bit less sweet (just for me)? You could always use less sugar, Margie. Or you could try honey or maple syrup in place of the sugar as well! would it work for a breakfast with eggs or french toast or something? I made two batches for Thanksgiving-2013 appetizers. The first batch was exactly to the recipe and was delicious. I added 1/2-teaspoon of cayenne pepper to the glaze in the second batch……it was GONE about 5 times as fast as the regular. It gave it a devilish little after-burn of heat. Thanks for the wonderful recipe! OK, I’m stumped. How do you get people to wait an hour after you make bacon to actually EAT bacon? HOLY MOLY! I could eat 5 lbs of this. That’s all fine and good, but what am I supposed to do with the leftover beer? These are awesome, I added a light dusting of a BBQ rub as they were cooling, well the sure we’re the hit of the party. I was inspired by your recipe and made my variation yesterday for my husband’s v-day present. I used half maple syrup and half bourbon and I start my bacon in a cold oven. It turned out great. Thanks for the inspiration! I live in England and we don’t get thick ‘streaky bacon ‘ like you get in the USA but we get thick ‘back bacon’ do you think that would work. ? Heidi, I think it would – worth a try anyways, right? Made it this morning for my husband’s birthday breakfast — we agreed it is absolutely the very best candied bacon ever. Thanks for the great recipe. This is looking delicious, will try it today. I am a big bacon lover but never tried it like this, looks amazing, you just made my day! made this tonight, it looks great just like the picture. I’m giving it all to my boss and my hubby and his co-workers. They will love it. I used Cracker Barrel brand, thick sliced, center cut. Used Kentucky Bourbon Barrel Ale for the beer. The bacon went four 10 minute rounds in the oven and turned out really well. I brought it to work for a potluck and everyone who had it was thoroughly impressed. My only issue was the bacon was still a little juicy the next day from the syrup marinating on it, which made even the crispy pieces a little flimsy. It was fantastic for burgers, but not the easiest to eat by itself. I let it sit on the rack for right around an hour; should I have let it sit longer? Also, I was thinking the next time I make this (and I definitely will be making this again) I might try thick-sliced maple flavored bacon, and maybe using a cider ale to get that apple/maple/brown sugar combo flavor going. Anyone tried using maple bacon? I think it would be fine with bourbon! Di you think this would work with a hard cider instead of beer? Can’t imagine it wouldn’t. This is sooo yummy! Thank you for the recipe! The only thing I added was a cayenne spiced bbq rub to the sauce. Gives it an extra kick! Just made these for Super Bowl. My house smells like a man cave and the bellies will be so happy around here. DELICIOUS! Thanks for the recipe! I made this yesterday. It was perfect. Everybody loved it. Thank you for sharing the recipe. Hi! Would you be able to store this overnight in a container without having to refridgerate? A couple weeks. I store in the refrigerator, but many people said that they stored it at room temperature and it was fine. Use your best judgement! Hi all! I’ve made this recipe a few times and love it! My only trouble is that it takes me forever to finish this recipe. I put the bacon in the oven for 10 minute intervals, and re-baste it during each interval. With 1 package of bacon, the bacon usually doesn’t look “done” for almost an hour. Am I doing something wrong? Is there a better/faster way to baste the bacon? Thanks! Maybe crank up the heat in your oven a little bit more – sounds like it’s not hot enough. I’ve made this monthly for the past 2 years. And during football season, I average 4 lbs on sundays. I can barely get it out of the oven and the boys eat it. I twist the bacon so more fit on the rack.